In December we slaughtered a steer that we bred on the farm which was our best calf for 2010. The farm crew assisted the slaughterman in butchering and packing the meat into 5 kg trays then we delivered a tray to each house on the Trust. The farm crew had a well earned break over Christmas using their annual leave and returned to work in January. In the last few weeks we have been selling calves off the cows which have been sent to both Bairnsdale Saleyards and Eastern Abattoirs. We were lucky to have a nice line of steers one of which made the top price per kilo for the sale day. After a very successful year with the welding course we decided to continue on this year. As well as continuing with our projects in the shed, we attended Kennedy’s Aluminium, Kennedys Trailers and Granite Rock Quarry, where we got to see large scale machinery and engineering equipment in action. In November we did a machinery licensing program. 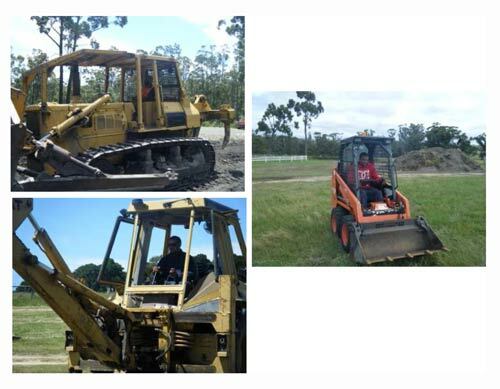 In this program we hired a bobcat, excavator and dozer and also used our backhoe and front end loader. We did some training on these machines and then obtained our operators tickets. The plantation is looking good with the lower limbs on the trees pruned. We engaged a forestry expert to teach us various ways to look after the different species of trees which we all found very interesting. Other projects that we are currently working on are blackberry spraying, slashing, fencing and fire breaks.